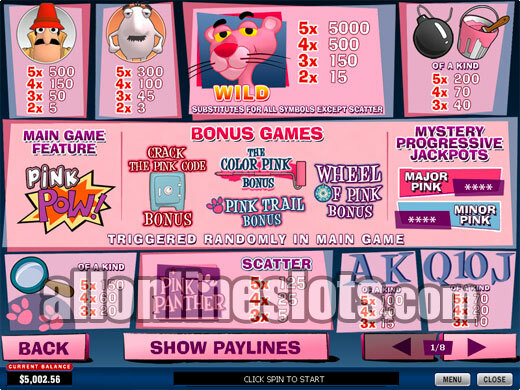 Pink Panther is a Playtech video slot with 40 pay lines, a big range of six different bonus features and a gamble option. It also has a two tier random jackpot link that starts at 100.00 for the Minor and 1,000 for the Major. 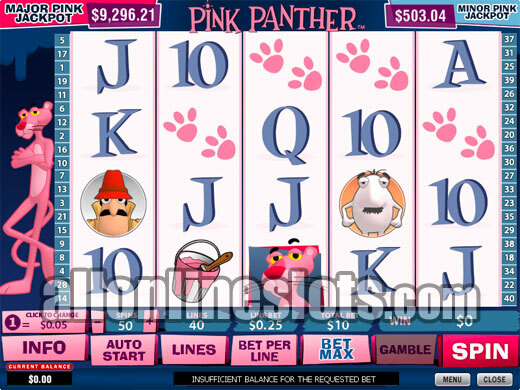 Pink Panther is a feature packed 40 line video slot found at all Playtech casinos. The game uses the 4x5 reel format instead of the more common 3x5 format. As well as the reel based jackpots the game has a two tier random jackpot link with the Major Jackpot regularly hitting around the 10,000.00 mark. As you would expect, the game has a Pink Panther theme which is based on the hit films which started back in 1963 and recently have been renewed with new films starring Steve Martin as Jacques Clouseau in 2006 (Pink Panther) and 2009 (Pink Panther 2). It's not the first time the Pink Panther has appeared on a slot machine with both IGT and Aristocrat having released Pink Panther theme games in land-based casinos. 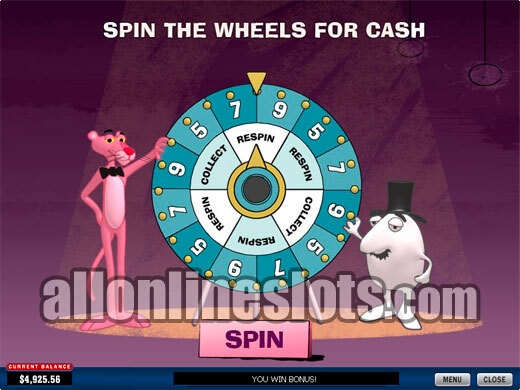 It is however the first time the Pink Panther theme has been used for an online slot machine. Max bet on Pink Panther is 400 coins per spin or 10 coins per line. Coin sizes range from 0.01 to 5.00 so you can bet hitting the max bet button for as little as 0.40 per spin or as much as 2,000.00 per spin with a lot of options between these two levels. On the reels, the Pink Panther symbol is wild and substitutes for all other symbols but the scattered logos. Getting five Pink Panther symbols on any active line pays 5,000 coins or 50,000 coins if you are playing max bet. Second highest line win is 500 coins which is won with either four wilds (aligned left to right) or five of the Jacques Clouseau symbols. After the top two line wins the rest of the five of a kind pays range from between 300 and 70 coins. As well as all of the line wins there is also a scatter pay for the scattered Logo symbols. Get three, four or five anywhere on the screen and you win 40X, 70X or 200X your total bet. This makes the win for five scatters at max bet come in at 80,000 coins. Pink Panther has six different bonus features but interestingly enough they are not triggered by anything on the reels. Instead all six bonus are triggered randomly at the end of any spin. While this makes the game exciting it also detracts a bit as you don't have the same feeling as seeing two bonus symbols on the reels and waiting for the third. This reel based bonus adds extra wild symbols to the reels at the end of a spin. The extra wilds make getting the top jackpot a lot easier. A second screen bonus where you have ten safes to choose from. Each pick awards either free spins, a multiplier or an expanding wild on reel three. You get to keep picking until you uncover a dynamite stick which adds 2 free games and ends the bonus. This is the only free spin bonus the game has. A second screen stage where you have Pink Panther and Little Man standing in front of a fence. You click paint and any pink numbers on the screen award win multipliers based n your total bet. You can repaint the wall up to three times if you're not happy with the result. A Wheel of Fortune style bonus where you have win multipliers on the outside reel and "Collect" or "Respin" segments on the inner wheel. You get to keep spinning the wheel until the inner wheel lands on Collect. 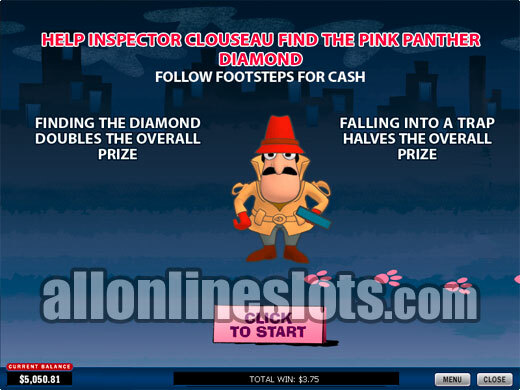 This bonus has Jacques Clouseau in pursuit of a stolen diamond. There are four possible rounds with each step awarding a bonus prize. After each round you can choose to continue or collect. If you continue and find the diamond all wins are doubled. If however you fall into a trap all wins are halved. This is the progressive jackpot link bonus where you can win one of the two progressives or a consolation prize. You have twelve doors and need to click doors to reveal either Pink Panther, Little Man or Inspector Clouseau. Matching five Pink Panthers awards the Major, Four Inspector Clouseau wins the Minor and three Little Man award the consolation prize. The jackpot feature is timed so you have to click quickly. If you run out of time doors are auto picked and one of the three wins are awarded. In addition to all of the base game wins and bonus game wins you also have a video poker style double up feature. At the end of any winning spin you can try your luck doubling up all or half of your win. The aim of the double up feature is to pick a card with a higher value than the one displayed face up. Clearly, Pink Panther has a lot of ways to win which is always a good thing. The fact that every feature is triggered randomly might not be to every ones tastes but all of the bonuses capture the theme really well. In the end, the only online version of Pink Panther stands up very well to the other land based versions from IGT and Aristocrat.